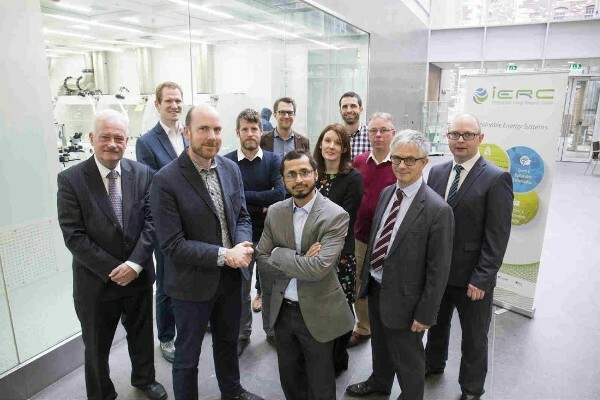 The StoreNet project was launched this week at Tyndall National Institute by representatives from IERC, Electric Ireland, Solo Energy, and ESB Networks. Image: Tyndall National Institute. Battery storage and smart technologies are to be rolled out to homes in the Irish town of Dingle as part of a new trial to test their potential to support the use of variable renewable energy supply resources and smart connection to the Irish electricity grid. Twenty homes will be selected to take part in the €1.12 million (£1 million) StoreNet project, which was officially launched by the International Energy Research Centre (IERC) on Tuesday (12 December) and will last up to two years. The programme will install residential battery storage systems to operate in the form of a virtual power plant (VPP) in Dingle to integrate with energy supply and demand management and operate at scale across a community. The project aims to reduce energy costs for residents, relieve pressure on the grid during peak times and contribute to the wider energy transition. The consortium behind the project - Electric Ireland, renewable supplier and technology provider Solo Energy, and network operator ESB Networks – will select both homes with and without existing solar PV to take part. The project aims to install batteries ranging from 7-11kWh in Q2 2018, with procurement already underway to batteries from different suppliers that could interact with both the grid and solar PV. Matthew Kennedy, head of Strategy and Business at IERC, told Solar Power Portal: “We will probably select three of four batteries which we would test that are readily available, could work within our grid and the ones that are the most economically advantageous while providing the most output. Residents who generate electricity from renewable resources on their premises will store excess energy in the battery, and deploy their stored energy rather than energy from the Irish grid during peak times. Additional ‘smart’ charging of the batteries during off-peak times will also aim to relieve pressure on the grid while reducing the cost of supply to the residents. Brian Ryan, head of customer innovation at Electric Ireland said: “Electricity generated by renewable means is increasing, and storing this intermittently generated power provides a major challenge and also potentially, many benefits for energy customers. Kennedy explained that Solo Energy will work “very closely” on the virtual power plant and the information system that will link the systems together, while Electric Ireland will deploy an existing monitoring application used in the residential sector to engage consumers in terms of their usage. Liam Breathnach, Solo Energy’s chief technology officer, said: “Solo Energy combines distributed energy storage, cloud-based control and analytics to deliver on our goal of facilitating the progression to a 100% renewable energy future. “The StoreNet Project will allow ESB Networks to test how the smart network of the future will operate with the installation of battery storage in new and existing customer’s premises,” explained Jonathan Sandham, smart networks manager at ESB Networks. ESB Networks are focusing on Dingle to provide a number of different demonstration projects within the area, StoreNet being the first. The area was chosen due to the resilience of the local grid, the mixed range of dwellings, the combination of an urban population in the centre with those more dispersed around the town and its geographic location on a peninsula. ESB Networks already has a team on the ground in Dingle developing a consumer engagement strategy for the StoreNet project, and a number of residents have already put themselves forward to take part.